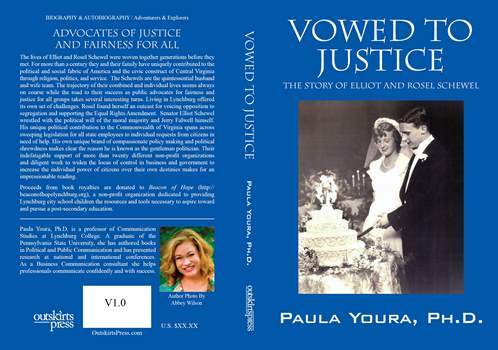 Vowed to Justice: The Story of Elliot and Rosel Schewel is a newly released biography written by Paula Youra, communications professor at University of Lynchburg. She will discuss the book at 7 p.m. Thursday, Oct. 30 in Sydnor Performance Hall in Schewel Hall. The brief talk will focus primarily on Elliot Schewel’s political rhetoric and Rosel Schewel’s contributions to civil rights in Lynchburg. Youra will provide an intimate glimpse into a family whose lives have shaped this community for more than 100 years. The remarks will be followed by a book signing. Books will be available for purchase at the event and can also be purchased in advance from Amazon.com or the University of Lynchburg Campus Store.